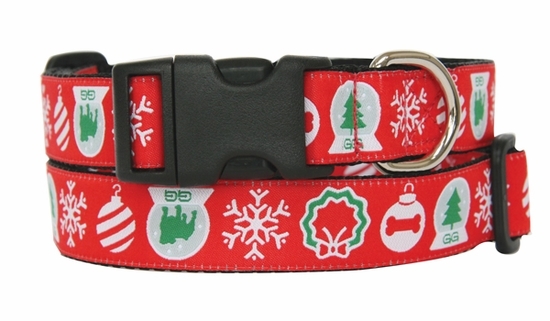 Home » S-XL Dog Collars » Holiday Wreaths, Snowflakes & Ornaments! Decorate your pet for the holidays with this adorable pattern! Snowflakes, snowglobes, wreaths and festive ornaments on vibrant Red. Made in the USA from durable 1/2"XS, 5/8 & 1" nylon webbing with high quality nickel plated hardware. Machine wash and line dry.